Neck spasms are involuntary contractions of the muscles in your neck. The muscles get tight, hard, and painful. Neck spasms may happen from an injury, overuse, poor posture, or stress. For example, it is common for people who do a lot of computer work to get a stiff neck. Spasms may even occur from an uncomfortable night’s sleep. Neck spasm is treated with stretching, massage, medicines (anti-inflammatory drugs or muscle relaxants), icing, and physiotherapy (flexibility exercises). Flexibility Exercises: These exercises help to relieve spasm and improve neck mobility. Neck Flexion: Sit erect; bend your head forward, try to touch your chin to your chest. Hold for 5 seconds. Repeat 8-10 times. Neck Extension – Take your head back so that your chin is pointing upwards. Repeat 8-10 times. Neck Rotation – Sit erect; then first turn your head slowly to the right. Move it back to the forward position. Relax. Then move it to the left. Repeat 8-10 times. Neck Side Bend: Sit erect; tilt your head so that your right ear moves toward your right shoulder. Then tilt your head, so your left ear moves toward your left shoulder. Make sure you do not rotate your head while tilting or raise your shoulder toward your head. Repeat this exercise 8-10 times in each direction. 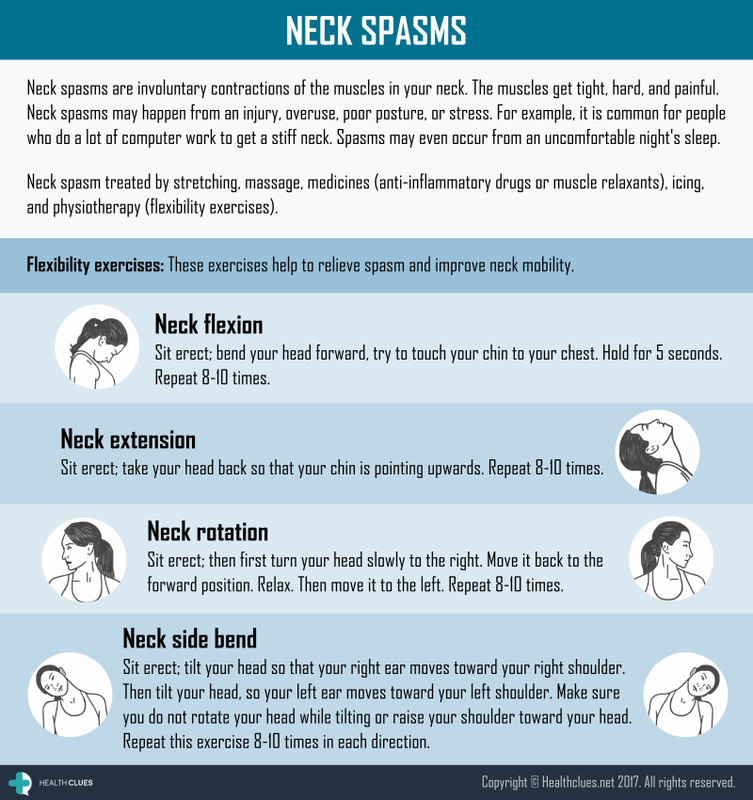 General, Infographics neck muscle pain, Neck pain, neck pain exercises, neck spasms, text neck. permalink.